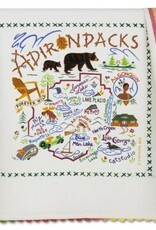 Keep the Adirondacks "close at hand" with this hand-embroidered and silk-screened dish towel! 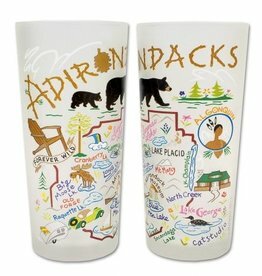 Remember all of your favorite Adirondack places like Lake Placid, Saranac Lake, Lake George, Tupper Lake, and Blue Mountain Lake along with the familiar black bear, Adirondack chair, and Adirondack Great Camps. 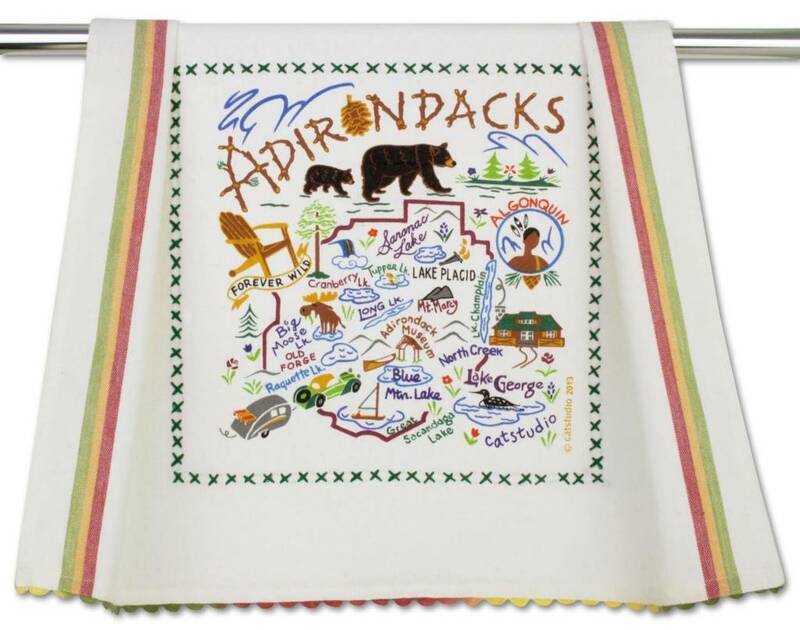 Almost too pretty to use, this Adirondack dish towel makes a wonderful gift for someone who has left their heart in the mountains. Created by Cat Studio, located in a quiet northern California town. The design on this 100% cotton dish towel is silk-screened, then framed with a hand embroidered border. Perfect for use as a dish towel, hand towel, or guest towel, or pretty enough to hang as wall décor. Hand dyed rick-rack at the top and bottom add a charming vintage touch. Delightfully presented in a fab organdy re-usable pouch! Cat Studio Adirondack dish towel measures 18" x 24". Design is silk-screened on 100% cotton dish towel.